Lindenwood University students Jon Elam and Michelle Sproat accepted their awards for best sports program and live sporting event at the 2017 NATAS Mid-America Student Television Awards on Sept. 9. 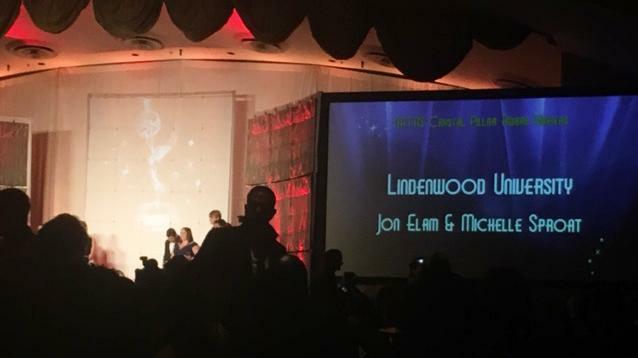 One Lindenwood student and to recent graduates won awards yesterday at the Mid-America Emmy Awards in St. Louis. Jon Elam, who graduated from Lindenwood in May, and Michelle Sproat, a current student, holding their awards for best sports program and live sporting event at the 2017 NATAS Mid-America Student Television Awards on Sept. 9. Of the three, only Sproat and Elam were at the conference. Sproat learned of her victory on May 10. She has entered the contest before, but this is the first time she won an award. Sproat said she knew they had a shot. Elam said he is proud of both of the productions they worked on, but the football game was his favorite. “It was a longer production, it was a whole football game, and you have a lot more people and there’s a lot more thought that goes into it,” Elam said. The event started at 4 p.m., and the student awards were at 6 p.m. The conference also held awards for professional organizations. Students who want to have a chance to win these awards or get more information about LUTV can contact Edward Voss at evoss@lindenwood.edu.